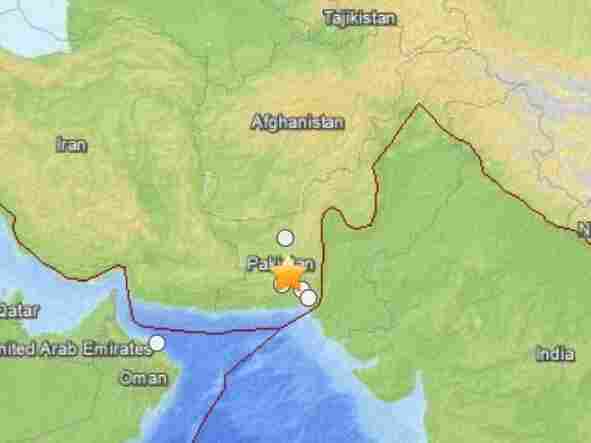 Dozens Killed By Strong Quake In Southwestern Pakistan : The Two-Way The 7.7-magnitude temblor struck the southern part of the country. Although there are reports of deaths, it could be several days before the full extent of any damage and destruction is known. A U.S. Geological Survey map showing the location of Tuesday's earthquake in Pakistan. A strong, 7.7-magnitude earthquake in southern Pakistan on Tuesday has killed at least 45 people, according to Reuters. The U.S. Geological Survey says the initial temblor was followed by several aftershocks — one of them a 5.9-magnitude. The affected area is reportedly about 145 miles southeast of Dalbandin in Pakistan's western province of Baluchistan. "Officials said scores of mud houses were destroyed by aftershocks in the thinly populated mountainous area near the quake epicenter in Baluchistan, a huge barren province of deserts and rugged mountains." "One man told Pakistan's Dunya television channel that he was sitting in his office when the building started shaking. Other residents said people started reciting verses from Islam's holy book, the Quran, when the quake began." NPR's Richard Harris notes that "when a quake strikes in a remote area, it can take many hours or even days to hear about the extent of damage it causes." In 2005, a 7.6-magnitude earthquake hit Pakistan's northern region of Kashmir, killing 75,000 people. In 2011, a 7.2-magnitude temblor struck roughly the same region of Pakistan hit on Tuesday. There were no casualties directly attributed to that quake. Another in April of this year, also in Baluchistan, killed 35 people.